Arrive 24th Apr. Afternoon filght in to Lima, Peru via Air Canada; evening at Hostal El Patio. 25th Apr. Back to the Airport for a flight to Cusco, Peru. mid day -check into Hostal San Isidro Labrador and settle things with Peru Treks. afternoon -half-day city tour of Cusco with a short side trip to Sacsayhuaman and Tambomachay. 26th Apr. Up early for a full day trip of the Sacred Valley. morning -Market at Pisca, some Chicha corn beer, picnic lunch at a park. 27th Apr. Trek Begins with an early pickup and then off to Calca for breakfast. morning -Start the trek near Lares (Quishuarani) and head over the Abra Hulliqukasa pass for lunch. afternoon -Head to and arrive at Cuncani for the first nights camp, beers to be purchased here, and a Birthday cake made for me by the trek cook. 28th Apr. Once again an early morning, and off for the highest pass of the trip. morning -Visit a locals home and check out the mountain viscacha (Lagidium viscaccia). afternoon -Over the pass (Paso Lpsaycocha) at 4350m (14,271ft), maybe not the highest I have been but still pretty high. We spend the night at 4200m (13,779ft) the highest I have ever camped. 29th Apr. Head back out of the high country and down to Patacancha and on to OllantayTambo. day-details After a soccer game at 3700m (12,139ft), and lunch in OllantayTambo we are on the train and arrive in Aguas Calientes. 30th Apr. Early morning wake up and off to Machu Picchu on a 20 minute bus ride. morning 2hr. 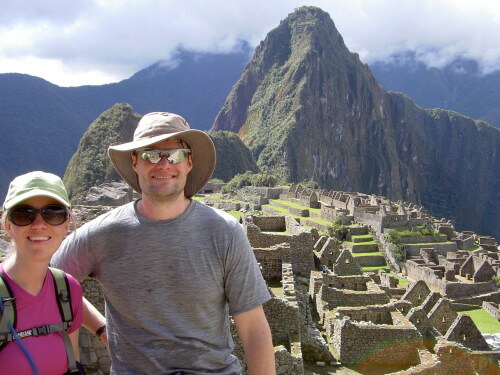 guided tour of the complex, 2 hours on Hauyna Picchu. afternoon 1hr hike out to the Inca Bridge and back, down to Aguas Calientes, train to OllanatayTambo, and bus to Cusco. 1st May Expected short day in Cusco turns into over night stay, but Tipon was awesome. 2nd May Rescheduled flight to Lima, afternoon walk around Miraflores. 3rd May A day of walking and exploring the Olive Grove and Barranco district. 4th May Early morning out with Mystery Peru to the Paracas, Islas Ballestas, ICA and El Catador Pisco Bodega, Huacachina, and on to Nasca. 5th May Out to the Nasca airport and a fly over the lines, a couple lines from a tower, lunch at the El Catador Pisco Bodega, and back to Lima for dinner at Astrid y Gaston.